Our guests describe the Chocolate Turtle as a warm, comfortable, relaxed New Mexico vacation spot. Located in the historic Village of Corrales, the one-level, southwestern-style home is nestled on one and a half acres, with the portal and patio facing the breathtaking Sandia Mountains. The pastoral setting provides a great escape from your daily hustle—our neighbors have horses, geese, and turkeys—yet our Corrales hotel alternative is just minutes from every shopping convenience and an array of local and national restaurants. The B&B is just a short walk from the acequia, a historic irrigation ditch system that runs throughout the Village. Along each side of the acequia there are walking paths that take you past orchards, horse farms, and beautiful southwestern style homes. You may be greeted by Corralenos riding their horses or walking their llamas. The Southwestern colors of turquoise, pottery, and yellow provide warm tones as background for the antiques and local art that adorn our walls. The native American pottery, wood carvings, paintings, and rugs all contribute to the overall relaxing atmosphere. Fresh flowers throughout our home and in the guestrooms and gardens of native plants are a signature of The Turtle, making us the perfect choice for your Albuquerque area accommodations. Another hallmark that draws rave reviews from guests is our delicious, hot breakfasts. Much of the year breakfast is served on the portal, where you will be entertained by the resident road runners, quail, and bunnies. As you eat, enjoy the scenery of the ever-changing Sandia Mountains visible from your Santa Fe area lodging. Read, watch TV, or gather in the Great Room to chat with your traveling companions or new-found friends. Also in the Great Room is a computer with high-speed Internet available for checking e-mails and printing boarding passes. If you bring your own computer there's wireless Internet connectivity available. In the cheery breakfast room, you will find an assortment of complimentary snacks, a refrigerator stocked with cold drinks, an individual gourmet coffee system and a teapot for almost instantaneous hot water for tea, hot chocolate, and hot cider. There's also a microwave available. The Chocolate Turtle Bed and Breakfast continues a twenty year tradition of fine hospitality with owners Denise Stramel and Keith Buderus. The husband-and-wife team from Pinewood Springs, Colorado assumed ownership of the bed and breakfast in 2013. The couple was primarily attracted to Corrales, New Mexico for its natural beauty, proximity to Albuquerque, and its slow-paced quaintness. Both Denise and Keith have been self-employed for nearly 20 years. Between them they have diverse and extensive experience in planning and producing special events, property management, and real estate. For this entrepreneurial pair the Chocolate Turtle offers an opportunity to apply their business management experience in an exciting new way. They also bring many long-time hobbies to the inn to add their own personal touches. Buderus is a lifelong gardener and loves to cook. Each morning guests will awake to a freshly-prepared breakfast. 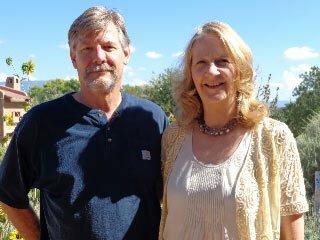 Denise and Keith are members of Main Street Corrales, the New Mexico Bed & Breakfast Association, and the Professional Association of Innkeepers International (PAII). Denise has joined a group of Corrales volunteers who plan and produce the village wide Harvest Festival each fall. 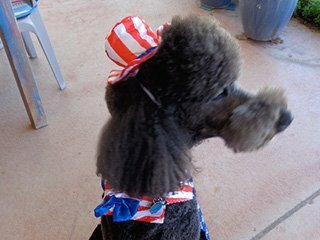 Their standard poodle Zorro has duty as B & B greeter and allows guests a much needed "dog fix" while they are away from their home and pets. Zorro takes part in the July 4th and Harvest Festival parades each year. 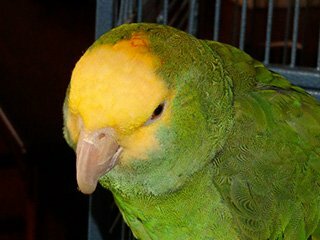 Rico, a double yellow head Amazon parrot, lives in the owners quarters but comes out for a daily visit on Keith's hand. He can be heard talking and meowing when he wants to join the guests. The foursome have settled happily in the Rio Grande Valley and look forward to meeting new travelers.